Francis John "Frank" Sladek was born November 11, 1895, in Chicago, Cook Co., IL, and died August, 1966, in Cicero, McHenry Co., IL, at age 70. Buried in Saint Adalbert Catholic Cemetery, Niles, Cook Co., IL. He is the son of Thomas "Tom" Sladek and Jessica "Lizzie" Cecil/Cesal of Bohemia of Czechoslavokia/Bohemia. 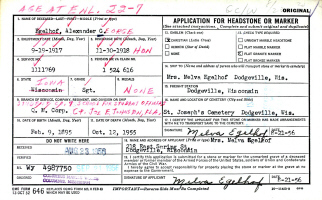 Melva Irene "Nova" Mayfield was born February 20, 1900, in Orion Twp., Richland Co., WI, and died August 17, 1969, in Dodgeville, Iowa Co., WI, at age 69. Buried in Saint Joseph Cemetery, Dodgeville, Iowa Co., WI. She is the daughter of Cyrus Lorin Mayfield of Richland Co., WI, and Iva May Abbey of Aldine Twp., Norton Co., KS. Francis John "Frank" Sladek (age 19) and Melva Irene Mayfield (age 16) were married February 20, 1916, in Wisconsin. Francis John "Frank" Sladek and Melva Irene (Mayfield) Sladek had no children. Francis John "Frank" Sladek and Melva Irene (Mayfield) Sladek divorced in 1933. Frank J. Sladek then married a divorcee, Mildred (Vondinska) Sulan. Mildred Vondinska was born July 10, 1916, in Illinois, and died April, 1979, in Illinois. Buried in Saint Adalbert Catholic Cemetery, Niles, Cook Co., IL. She is the daughter of Unknown Vondinska. Mildred was first married to Erwin J. Sulan. Erwin J. "Irvin" Sulan was born January 28, 1912, in Chicago, Cook Co., IL. He is the son of Jerry Sulan of Illinois, and Bessie Belek of Illinois. Erwin J. Sulan and Mildred Vondinska were married November 27, 1933, in Cook Co., IL. Erwin J. Sulan and Mildred (Vondinska) Sulan had no children. Erwin J. Sulan and Mildred (Vondinska) Sulan were divorced before 1940 in Illinois. Mildred (Vondinska) Sulan then married Frank J. Sladek. Frank J. Sladek and Mildred (Vondinska) Sulan were married 1940 - 1969. Melva Irene (Mayfield) Sladek then married Alexander George "Alex" Egelhof. Alexander George "Alex" Egelhof was born February 9, 1895, in Dubuque, Dubuque Co., IA, and died October 12, 1955, in Dodgeville, Iowa Co., WI, at age 60. Buried in Saint Joseph Cemetery, Dodgeville, Iowa Co., WI. He is the son of George Alexander Egelhof of St. Charles, MO, and Otilda L. "Tillie" Geissler of Dubuque, Dubuque Co., IA. Alexander George "Alex" Egelhof was first married to Winifred Catherine "Winnie" Baird. Winifred Catherine "Winnie" Baird was born October 24, 1899, in the Village of Maquon, Maquon Twp., Knox Co., IL, and died August, 1971, in Dubuque, Dubuque Co., IA, at age 71. She is the daughter of Elcana Hamilton Beard Baird of Washington, Hamilton Co., IN, and Margaret Mangner of Houston, MN. Alexander George "Alex" Egelhof (about age 24) and Winifred Catherine "Winnie" Baird (about age 20) were married July 1, 1919, in Dubuque, Dubuque Co., IA. Joseph Baird "Joe" Egelhof: Born January 2, 1920, in Dubuque, Dubuque Co., IA; Died April 7, 1980, at Staten Island Hospital, Ocean Breeze, Richmond Co., NY (age 60). Married 1946 in Warrenville, DuPage Co., IL, to Patricia Blanche Fay: Born November 26, 1925, in Oak Park, Cook Co., IL; Died March 10, 2003, at Staten Island University Hospital, Ocean Breeze, Richmond Co., NY (age 77). Mary Alice Baird Egelhof: Born September 28, 1922, in Dubuque, Dubuque Co., IA; Died February 18, 2009, in the Town of Christiana, Dane Co., WI (age 86). Buried in Saint Joseph Catholic Cemetery, Fort Atkinson, Jefferson Co., WI. Married September 30, 1944, in Alameda, CA, to Harold Emil "Hal" Marion: Born July 17, 1922, in New Hampton Twp., Chickasaw Co., IA; Died October 29, 1986, in Fort Atkinson, Jefferson Co., WI (age 64). Buried in Saint Joseph Catholic Cemetery, Fort Atkinson, Jefferson Co., WI. Alexander George "Alex" Egelhof and Winifred Catherine "Winnie" (Baird) Egelhof were divorced 1925 - 1930 in Dubuque, Dubuque Co., IA. Winifred Catherine "Winnie" (Baird) Egelhof then assumed her maiden last name, and did not remarry. Alexander George "Alex" Egelhof then married Dawn (Unknown) Unknown. Dawn Shaw was born November 21, 1889, in Michigan, and died July 22, 1977, in Bethesda Hospital, Chicago, Cook Co., IL, at age 87. Buried in Oakridge-Glen Oak Cemetery, Hillside, Cook Co., IL. She is the daughter of Unknown. Dawn Unknown was first married to Unknown. Unknown was born Unknown and died Unknown. He is the son of Unknown. Unknown and Dawn Unknown were married about 1908 in Unknown. Unknown and Dawn (Unknown) Unknown had no children. Alexander George "Alex" Egelhof and Dawn (Unknown) Unknown were married about 1925 in Illinois. Jayde Dale Egelhof: Born March 26, 1926, in Westmont, Du Page Co., IL; Died December 9, 2012, in Unknown (age 86). Married (1) February 1, 1949, in Cook Co., IL, to Virginia Loraine "Jennie" Alee: Born April 17, 1913, in Detroit, Wayne Co., MI; Died October 27, 2003, in Waterford, Oakland Co., MI (age 90). Married (2) October 9, 1958, in Cook Co., IL, to Ardelle M. Schroer: Born July 4, 1922, in South Dakota; Died April 26, 2008, in Chicago, Cook Co., IL (age 85). Ardelle M. Schroer was a teacher in Mitchell, SD, in 1948. In 1958 she was living in Hartford, CT, with her sister, Hattie Schroer, a Nurse at Veterans Hospital, Hartford, CT. By 1959, sister Lena A. Schroer was also living with them. By 1960, Lena and Hattie were living together, but their sister, Ardelle M. Schroer was shown as married to Jack Egelhoff, and having moved to Chicago, IL. Ardelle Schroer was a First Grade teacher in Mitchell, SD, in 1952. Virginia Loraine "Jennie/June E." Bronson was born January, 1893, in Lockport, NY, and died December 6, 1984, in Madison Heights, Oakland Co., MI (age 91). She is the daughter of William H. Bronson (born March 1861 in New York, and Hannah Minthorn (born June 1865 in Niagara Co., NY). Married as a Bookkeeper September 10, 1910, in Detroit, Wayne Co., MI, to Ralph Waldo Alee (age 24): Born January 28, 1886, in Alpena, Alpena Co., MI, to Spanish and Maine-born parents; Died Unknown. Divorced before 1930 in Unknown. Jennie Alee was a divorced Actress in Show Business living in Manhattan, NY, in 1930. Ralph Waldo Alee was born January 28, 1886, in Alpena, Alpena Co., MI, and died Unknown. He is the son of William Alee and Eva Green, Ralph was a Sight Seeing Bus Driver in Detroit, MI. Ralph Alee was an unmarried Lodger, and Jennie Bronson was an unmarried Actress, and were living in the William Bronson household in Detroit, MI, in 1910. Ralph Waldo Alee and Virginia Loraine "Jennie" Bronson were married September 10, 1910, in Detroit, Wayne Co., MI. Virginia Loraine "Jennie" Alee: Born April 17, 1913, in Detroit, Wayne Co., MI; Died October 27, 2003, in Waterford, Oakland Co., MI (age 90). Married February 1, 1949, in Cook Co., IL, to Jayde D. Egelhof: Born March 26, 1926, in Westmont, DuPage Co., IL; Died December 9, 2012, in Unknown (age 86). Ralph Waldo Alee and Virginia Loraine "Jennie" (Bronson) Alee were divorced about 1920. George Barnes Walbridge then married George Barnes Walbridge. George Barnes Walbridge and George Barnes Walbridge were married May 8, 1951, in Glennie, MI. Ralph Waldo Alee then married Edna M. Beckett. Edna M. Beckett was born March 23, 1898, in Greenfield, Wayne Co., MI, and died June 2, 1976, in Detroit, Wayne Co., MI, at age 78. She is the daughter of Edmond Beckett of New York, and Anna Susannah Unknown of Canada. Edna Alee was a professional sharpshooter, and was billed as "The Second Annie Oakley." She was featured by Ripley and was able to hit the edge of a playing card 63 ft. away with a revolver, which she held upside down. 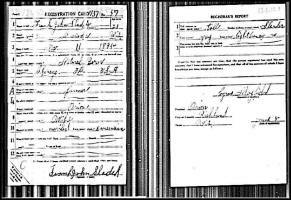 Ralph Waldo Alee and Edna M. Beckett were married October 28, 1919, in Detroit, Wayne Co., MI. Ralph Waldo Alee and Edna M. (Beckett) Alee had Unknown children. Edna Alee was a revolver trick shooter. Ralph Waldo Alee: Born March 11, 1928, in Michigan; Died Unknown. Married to Elizabeth K. Unknown: Born October 13, 1939, in Unknown. Alexander George "Alex" Egelhof and Dawn (Unknown) (Unknown) Egelhof were divorced about 1933 in Illinois. Alexander George "Alex" Egelhof and Melva Irene (Mayfield) Sladek were married in 1934. Alexander George "Alex" Egelhof and Melva Irene (Mayfield) (Sladek) Egelhof had no children. Melva Irene (Mayfield) (Sladek) Egelhof is buried in Saint Joseph Cemetery, Dodgeville, Iowa Co., WI. Thanks to Find-A-Grave for making this image available. Alexander George "Alex" Egelhof is buried in Saint Joseph Cemetery, Dodgeville, Iowa Co., WI. Thanks to Find-A-Grave for making this image available. Ralph Waldo Alee was born January 28, 1886, in Alpena, Alpena Co., MI. Dawn Unknown was born November 21, 1889, in Michigan. Virginia Loraine "Jennie/June E." Bronson was born January, 1893, in New York. 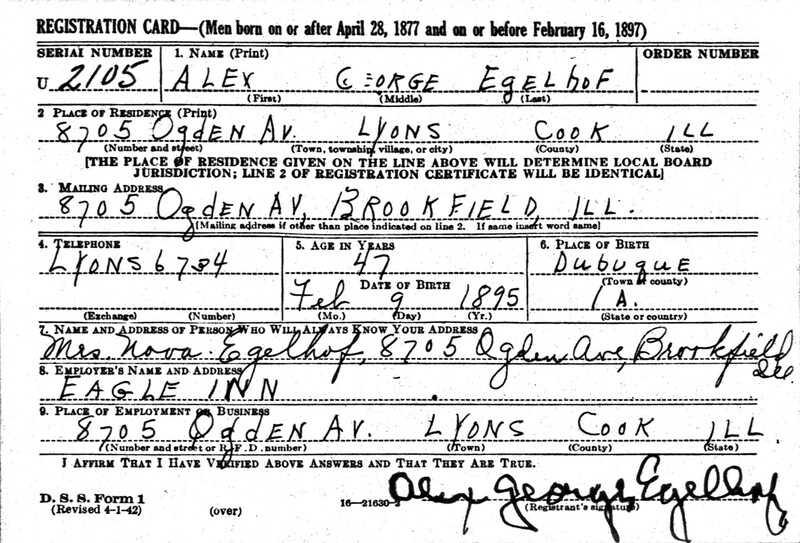 Alexander George "Alex" Egelhof was born February 9, 1895, in Dubuque, Dubuque Co., IA. Francis John "Frank" Sladek was born November 11, 1895, in Chicago, Cook Co., IL. Edna M. Beckett was born March 23, 1898, in Greenfield, Wayne Co., MI. Winifred C. "Winnie" Baird was born October 24, 1899, in the Village of Maquon, Maquon Twp., Knox Co., IL. 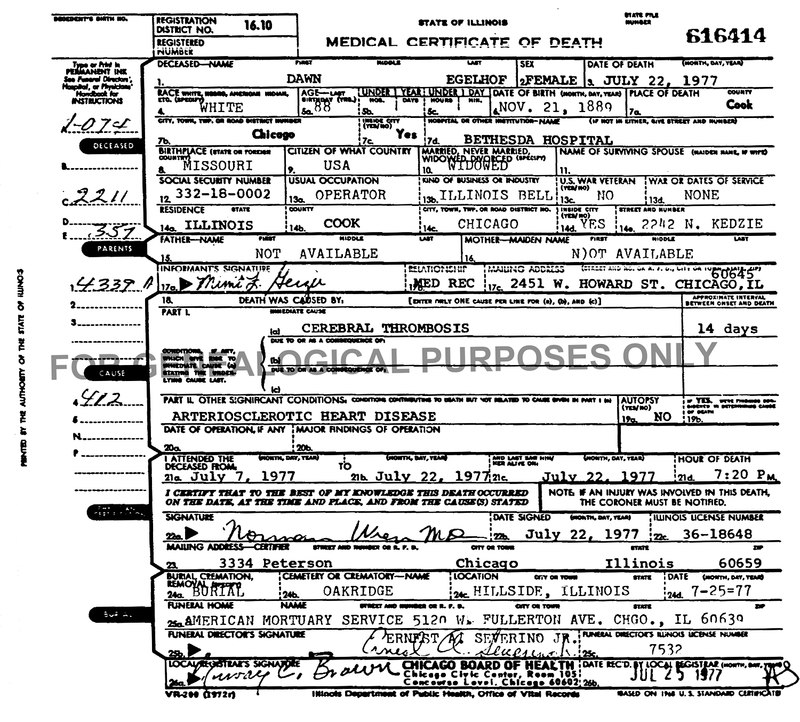 Melva Irene Mayfield was born February 20, 1900, in Orion Twp., Richland Co., WI. 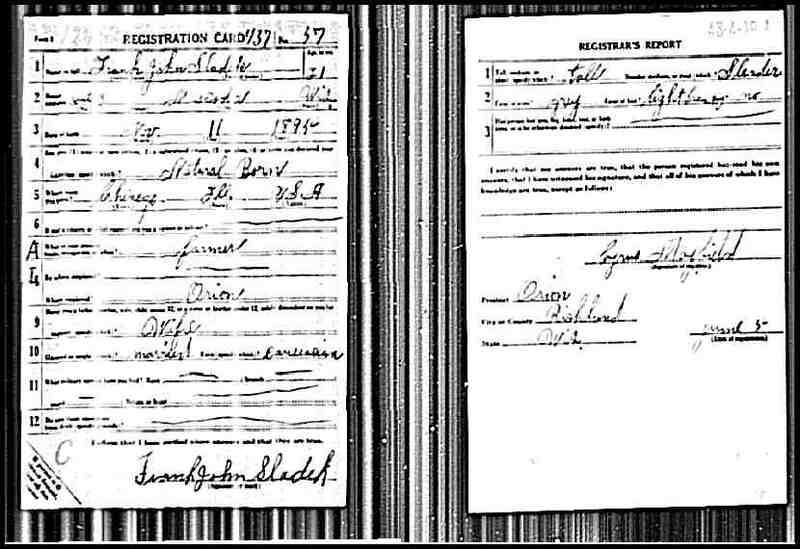 The 1900 U. S. Census taken on June 12, 1900 shows Cyrus L. Mayfield (age 22) born August 1877 in Wisconsin of Wisconsin-born parents is a day laborer owing his home and living in Orion Twp., Richland Co., WI. He has been married for one year to Iva May Mayfield (age 22) born March 1878 in Kansas to Kansas and Wisconsin parents. 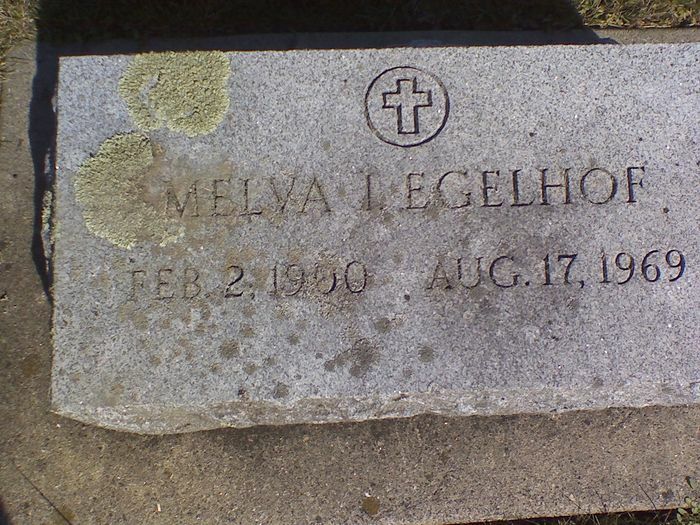 Her one child is living: Melva Mayfield (age 3/12) born February 1900 in Wisconsin to Wisconsin and Kansas parents. Elijah Mayfield and family (Cyrus' parents) live on the adjacent farm. Salome (Blake) Pugh and family also lived nearby. The 1900 U. S. Census taken on June 12, 1900 shows George Egelhof (age 33) born March 1867 in Missouri to German-born parents is a Roof Slater renting his home and is living at 47 Schroeder Ave., 5th Ward, Julien Twp., Dubuque Co., IA. Living with him is his wife of 6 years, Otilda Egelhof (age 33) born March 1867 in Iowa to German-born parents, with all 3 of the children born to her still alive. Also living there are his three children, all born in Iowa to Missouri and Iowa-born parents: Alexander G. Egelhof (age 5) born February 1895; Peter J. Egelhof (age 2) born June 1897); and Agnes M. Egelhof (age 9/12) born August 1899). The 1900 U. S. Census taken on June 2, 1900 shows Thomas Sladek (age 35) born November 1864 in Bohemia to Bohemian-born parents and having immigrated in 1888 and a Naturalized citizen is a Press Founder renting his home and is living at 15 Fisk Street, 8th Ward, West Town, Chicago, Cook Co., IL. Living with him is his wife of 10 years, Jessica Sladek (age 33) born September 1866 in Bohemia to Bohemian-born parents and having immigrated in 1886, with all 4 of the children born to her still alive. Also living there are his four children, all born in Illinois to Bohemian-born parents: John Sladek (age 10) born May 1890; Annie Sladek (age 8) born December 1891; Frank Sladek (age 4) born October 1895); and Otto Sladek (age 5/12) born December 1899. The 1905 Iowa State Census shows George Egelhof is living at 135 Angellina St., City of Dubuque, Dubuque Co., IA. Living with him are Otilda Egelhof, Alexander Egelhof, Peter Egelhof, Agnes Egelhof, Mable Egelhof, and Bernedetta Egelhof. The 1905 Iowa State Census shows George Egelhof is living at 360 Rush St., City of Dubuque, Dubuque Co., IA. Living with him are Otilda L. Egelhof, Alexander G. Egelhof, Peter J. Egelhof, Agnes O. Egelhof, Mabel M. Egelhof, and Estella B. Egelhof. 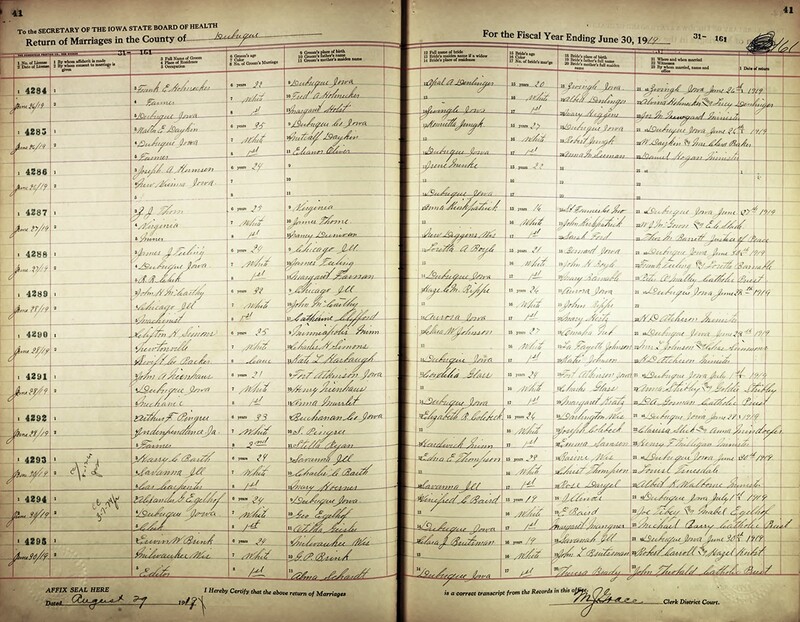 The 1910 U. S. Census taken on April 19, 1910, shows George Egelhof (age 40) born in Missouri to German-born parents is a Blacksmith in a Boat Factory who owns his home with a mortgage and is living at 360 Rush Street, 1st, Dubuque, Julien Twp., Dubuque Co., IA. Living with him is his wife of 16 years, Otilda Egelhof (age 43) born in Iowa to German-born parents, with all 6 of the children born to her still alive. Also living there are his six children, all born in Iowa to Missouri and Iowa-born parents: Alexander Egelhof (age 15); Peter Egelhof (age 13); Agnes Egelhof (age 10); Mabel Egelhof (age 8); Bernedetta Egelhof (age 6); and Augusta Egelhof (age 3). The 1910 U. S. Census taken on April 16, 1910 shows Thomas Sladek (age 47) born in Austria/Bohemia/Czechoslovakia to Austrian/Bohemian/Czechoslovakian-born parents, and in his second marriage, and having immigrated in 1890, is a married General Farm Farmer who owns his farm with a mortgage, and is living in Germantown Twp., Juneau Co., WI. Living with him are: his wife of 8 years, Mary Sladek (age 48) born in Austria/Bohemia/Czechoslovakia to Austrian/Bohemian/Czechoslovakian-born parents, and in her second marriage, and having immigrated in 1873, with 6 of the 9 children born to her still alive, a Farm Laborer on the Home Farm; his son, Frank Sladek (age 14) born in Illinois to Austrian/Bohemian/Czechoslovakian-born parents, a Farm Laborer on the Home Farm; his son, Otto Sladek (age 10) born in Illinois to Austrian/Bohemian/Czechoslovakian-born parents, a Farm Laborer on the Home Farm; his daughter, Blanch Sladek (age 3) born in Illinois to Austrian/Bohemian/Czechoslovakian-born parents; his unmarried step-son, Eddie Honda (age 18) born in Illinois to Austrian/Bohemian/Czechoslovakian-born parents, a Farm Laborer Working Out; his unmarried step-daughter, Bessie Honda (age 16) born in Illinois to Austrian/Bohemian/Czechoslovakian-born parents, a Farm Laborer on the Home Farm. Erwin J. Sulan was born January 28, 1912, in Chicago, Cook Co., IL. The 1915 Iowa State Census shows Alexander Egelhof (age 19) born in Iowa to Missouri and Iowa-born parents is an unmarried Order Clerk living in the 1st Ward, City of Dubuque, Dubuque Co., IA. Living with him are Otilda L. Egelhof, Alexander G. Egelhof, Peter J. Egelhof, Agnes O. Egelhof, Mabel M. Egelhof, and Estella B. Egelhof. Mildred Vondinska was born July 10, 1916, in Illinois. Alexander George "Alex" Egelhof (about age 24) and Winifred C. Baird (about age 20) were married July 1, 1919, in Dubuque, Dubuque Co., IA. Alexander George "Alex" Egelhof and Winifred C. Baird Marriage Record. The 1920 U. S. Census taken on January 10, 1920 shows Frank J. Sladek (age 24) born in Illinois to Bohemian-born parents is a dairy farmer renting his farm in Richland Twp., Richland Co., WI. Living with him is his wife Melva I. Sladek (age 18) born in Wisconsin to Wisconsin-born parents. The 1920 U. S. Census taken on January 16, 1920 shows Alex Egellhof (age 24) born in Iowa to Missouri and Iowa-born parents is Unemployed and is renting his home at 21 Holly Street, 1st Ward, City of Dubuque, Dubuque Co., IA. Living with him is his wife, Winefred Egellhof (age 20) born in Illinois to Indiana and Minnesota-born parents, who is also Unemployed. 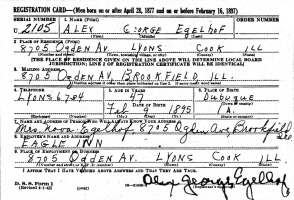 The 1930 U. S. Census taken on April 14, 1930, shows Alex G. Egelhof (age 34) born in Iowa to Missouri and Iowa-born parents and first married at age 21 is a Railroad Depot Agent who owns his home worth $3,400 and is living at 249 N. Warwick Avenue, Village of Westmont, Du Page Co., IL. Living with him is his wife, Dawn Egelhof (age 32) born in Michigan to New York-born parents and first married at age 19. Also living there is his son, Jayde Egelhof (age 4) born in Illinois to Iowa and Michigan-born parents. 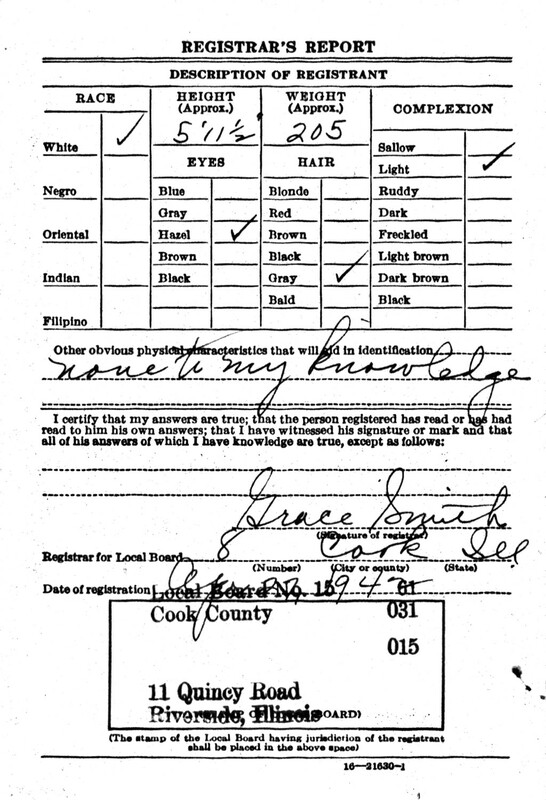 The 1930 U. S. Census taken on April 23, 1930 shows Frank Sladek (age 33) born in Illinois to Czechoslovakia-born parents and first married at age 19 is a Truck Driver and is renting his home at 7338 40th Street, Precinct 1, Village of Lyons, Cook Co., IL. Living with him is his wife, Melva Sladek (age 30) born in Wisconsin to Wisconsin-born parents and first married at age 16. 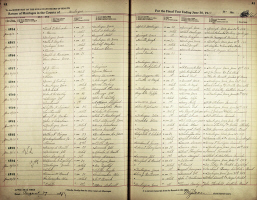 The 1930 U. S. Census taken on April 11, 1930, shows Elcana Baird (age 62) born in Indiana to South Carolina and Indiana-born parents and first married at age 30 is a Sash and Door Millworker who owns his home worth $3,000 and is living at 751 Cleveland Avenue, Dubuque, Julian Twp., Dubuque Co., IA. Living with him is his wife, Margeret H. Baird (age 57) born in Minnesota to Irish Free State-born parents and first married at age 26. 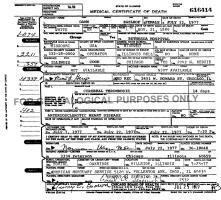 Also living there are his three children: Winifred Baird (age 30) born in Illinois to Indiana and Minnesota-born parents, a divorced Public School Teacher; his son, Joseph Baird (age 10) born in Iowa to Iowa and Illinois-born parents; and Mary A. Baird (age 7) born in Iowa to Iowa and Illinois-born parents. The 1940 U. S. Census taken on April 11, 1940 shows Harry Brooks (age 49) born in Illinois, and 5 years ago was living in the Same Place, and with 8 years of School, is a widower Salesman at a Public Utility, and is renting his home for $40/month, and is living at 6456 Blackstone Avenue, 6th Ward, City of Chicago, Cook Co., IL. Living with him are: a divorced female, Dawn Egelhof (age 37) born in Illinois, and 5 years ago was living in the Same Place, and with 2 years of High School, a Maid at a Hotel; a widower male, Oscar Bjork (age 52) born in Illinois, and 5 years ago was living in the Same Place, and with 8 years of School, is a Maid at a Hotel; a Public Cartage Truck Driver; and an unmarried male, Jayde Egelman (age 39) born in Illinois, and 5 years ago was living in the Same Place, and with 3 years of High School, an Auto Repair Maintenance Man. 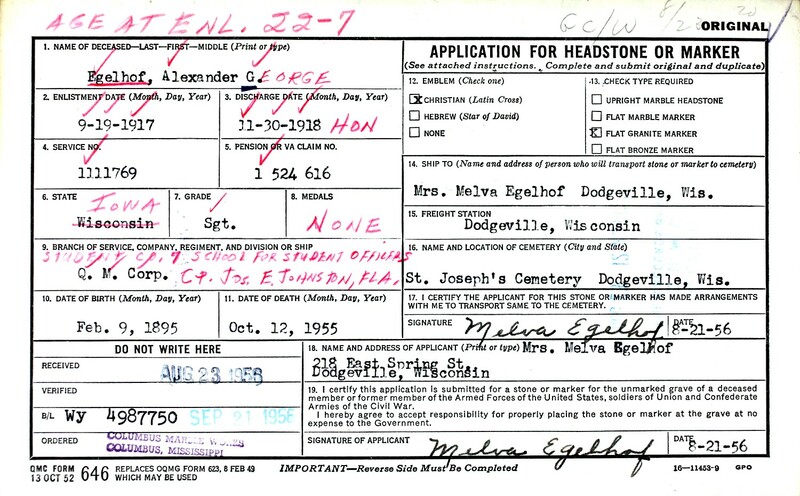 The 1940 U. S. Census taken on April 23, 1940 shows Alexander Egelhof (age 45) born in Iowa, and 5 years ago was living in Westmont, Du Page Co., IL, and with 4 years of High School, is a married Retail Sign Sales Salesman, and is Lodging at 116 Madison, City of La Grange, Lyons Twp., Cook Co., IL. The 1940 U. S. Census taken on April 23, 1940 shows Dawn Egelhof (age 37) born in Illinois, and 5 years ago was living in the Same Place, and with 2 years of High School, is a divorced Hotel Maid, and is Rooming at 316 Blackstone Avenue, 6th Ward, City of Chicago, Cook Co., IL. The 1940 U. S. Census taken on April 22, 1940 shows Frank Sladek (age 43) born in Illinois, and 5 years ago was living in the Same Place, and with 8 years of School, is a divorced Proprietor of his Own Tavern. and is renting his home for $120/month, and is living at 7338 40th Street, 6th Ward, City of Lyons, Cook Co., IL. Living with him is a divorced female Lodger, Mildred Sulan (age 23), born in Illinois, and 5 years ago was living in Chicago, Cook Co., IL, and with 1 year of High School, a Cook in a Tavern. 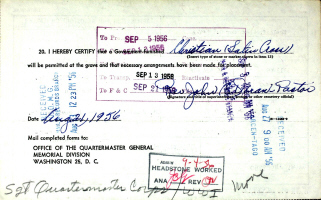 Alexander George "Alex" Egelhof WWII Draft Registration Report. 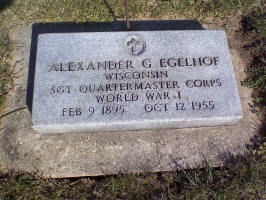 Alexander George "Alex" Egelhof died October 12, 1955, in Dodgeville, Iowa Co., WI, at age 60. Buried in Saint Joseph Cemetery, Dodgeville, Iowa Co., WI. 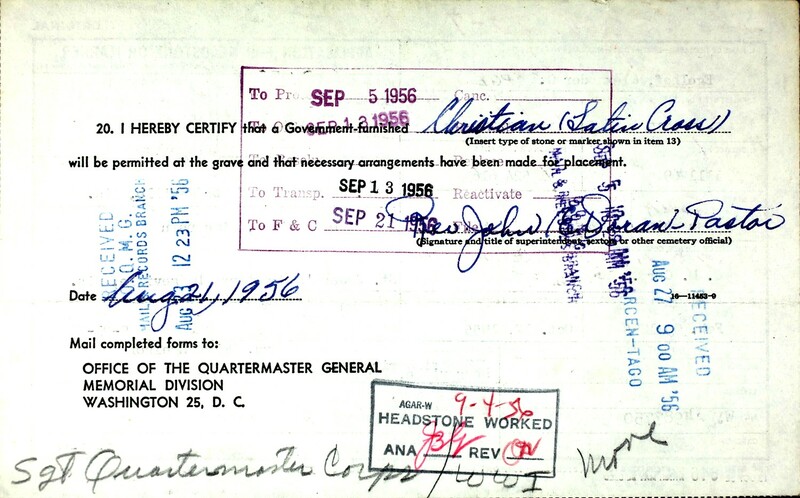 Alexander George "Alex" Egelhof Military Gravestone Request. Francis John "Frank" Sladek died August, 1966, in Cicero, McHenry Co., IL, at age 70. Frank J. Sladek, late of 2407 S. Springfield avenue, and 5129 S. 30th street, Cicero, Ill, beloved husband of Mildred; dear father of Franklin (Hazel), Sharon Kalebic, and Randy Sladek; brother of Otto, Ann Sedlacek, and Blanche Peck; grandfather of four. Funeral Tuesday, Sept. 6, 1966, at 8:45 a.. m., from H. Marik Sons, 2534 S. Pulaski road, to Epiphany church. Mass 9:30 a. m. Interment St. Adalbert's cemetery. LA 1-3972. Leigh Larson note: Weaver, IA, should be Wever, Lee Co., IA. George Egelhof passed away Sunday night at 5:40 o'clock at the family residence, 360 Rush Street after an illness of six weeks duration of heart trouble. Deceased was in his forty ninth year and was born in St. Charles, Mo. At the age of one year he moved with his parents to East Dubuque, where he remained until thirty years ago when he came to this city and had resided here ever since. He was united in marriage to Otilda Giessler February 1st, 1894, who, with the following children survive him: Alex, Peter, Mrs. Harry Splinter, Mable, Bernadette and Augusta, also his parents, Mr. and Mrs. Theobald Egelhof, of Hazel Green, two sisters, Mrs. Charles Norris, East Dubuque, and Mrs. Byron Van Vleck of this city and five brothers, Joseph of Platteville, Wis.; John of New Diggings Wis.; Edward of Hazel Green, Wis.; Fred of this city; and Private Henry, in service in France. For the last ten years he was engaged in the dairy business. Mr. Egelhof was a faithful member of St. Columbkille's church. Mr. Egelhof's life was of faithful service to his family and the community loses a valuable citizen in his death. Many friends will greatly regret to learn of his passing. He was a member of St. Columbkille court, Catholic order of Foresters and Dubuque Lodge, No. 984 M. W. A. The funeral will be held Wednesday morning at 9 o'clock from home to St. Columbkille's church with interment at Mt. Calvary. Pall bearers included: Fred Spielman, Henry Kuenzel, J. C. Mcquillian, Peter Heinz, Theodore Schilling and F. L Egelhof. Edna M. (Beckett) Alee died June 2, 1976, in Detroit, Wayne Co., MI, at age 78. Dawn (Shaw) (Unknown) Egelhof died July 22, 1977, in Bethesda Hospital, Chicago, Cook Co., IL, at age 87. Buried in Oakridge-Glen Oak Cemetery, Hillside, Cook Co., IL. Dawn (Shaw) (Unknown) Egelhof died July 22, 1977, in Bethesda Hospital, Chicago, Cook Co., IL, at age 87. Buried in Oak Ridge (Glen Oak) Cemetery, Hillside, Cook Co., IL. Mrs Otilda Egelhof, widow of George Egelhof, died at 2:15 p. m. Sunday at the family residence 1006 Rush St. after a short illness. Friends may call after 7 p. m. Monday at the Egelhof Funeral Home, from where services will be held to Saint Columbkille's Church at 9 a. m. Wednesday. Burial will be in Mt. Calvary Cemetery. The rosary will be recited at 7:30 p .m. Tuesday at the funeral home by the Ladies Catholic Benevolant Society and at 8 p. m. by the Sacred Heart League ant Rosary Society. Mrs. Egelhof was born in Dubuque, the daughter of Charles and Agatha Jaeger Giessler and was a lifelong resident of the city. She was a member of St. Columbkille's Church, the Sacred Heart League and Rosary Society of the parish and the Ladies' Catholic Benevolent Society. Surviving are four daughters, Miss Mabel M. Egelhof, at home, Mrs. Harry (Agnes) Splinter, Milwaukee, Wis., and Mrs. Robert (Bernadette) Genz and Mrs. V. F. (Augusta) Chapman, both of Dubuque, and two sons, Alex G. Egelhof, Dodgeville, Wis. and Peter J. Egelhof, La Crosse, Wis.
Mary Marion, 86, of Fort Atkinson, passed away on Wednesday, Feb. 18, 2009. Mary was born in Dubuque, Iowa, on Sept. 28, 1922, the daughter of Winifred C. Baird. On Sept. 30, 1944, Mary married Harold E. Marion in Alameda, Calif. Hal preceded her in death on Oct. 29, 1986. She received her bachelor's degree from Clarke College in Dubuque, Iowa, and her master's degree from the University of Wisconsin-Whitewater. Mary taught reading in the Whitewater Unified School District for 20 years, retiring in 1985. Mary was an active volunteer with the American Cancer Society, Tomorrow's Hope, the Jefferson County Literacy Council and the Irvin L. Young Auditorium. She enjoyed painting and entering her works in local art shows. Mary was a faithful and active member of St. Joseph Catholic Church. She was a facilitator for word and Communion services, helped with monthly Eucharistic adoration, was a Eucharistic minister, a member of the parish choir and participated in scripture study. Mary also established a parish library for St. Joseph Church. Surviving are two daughters, Laura (Dr. Craig) Nevermann of Jefferson and Marty (Craig) Artl of New Berlin; grandchildren, Mark (Kelly), Alex (Jessica), Eric, Christopher and Alyssa Nevermann, and Paul and Tim Artl; and two great-grandchildren, Drew and Joseph Nevermann. Mary also was preceded in death by her mother and a brother, Joseph B. Egelhof. A Mass of Christian Burial will be held at 11 a.m. on Tuesday, Feb. 24, at St. Joseph Catholic Church in Fort Atkinson with the Rev. Jay Poster celebrating. Burial will follow in the St. Joseph Catholic Cemetery in Fort Atkinson. Friends may call from 4 to 6 p.m. on Monday, Feb. 23, at the Nitardy Funeral Home in Fort Atkinson with the parish rosary recited at 6 p.m. They also may call at the church on Tuesday from 10 a.m. until the time of Mass. Those planning an expression of sympathy may wish to consider memorials to St. Joseph's Parish Library or to Tomorrow's Hope. TOWN OF CHRISTIANA, Wis. -- An elderly woman was killed on Wednesday afternoon after her car crashed head-on into a minivan in the Town of Christiana. The crash closed down a part of Highway 12/18 near Cambridge for most of the afternoon. The Dane County Sheriff's Office said that Mary Marion, 86, was driving eastbound when she apparently crossed the centerline, colliding head-on with a minivan driven by a woman and her 3-year-old son. Anissa Rusch-Hallanger, 39, was taken to a local hospital with serious, but non-life-threatening injuries. Her son appeared to be uninjured, but was taken to the hospital on precaution, authorities said. Jamey Scott of the Cambridge Fire Department said that rescuers use the Jaws of Life to save one of the victims. "The female in the minivan was pinned inside the vehicle and we did use the Jaws and extricated her after about 10 minutes of work," he said. Dane County officials said that they're still trying to determine what caused the crash. "Well, we're going to probably talk to witnesses again and the driver who survived," said Lt. Dan Bolch of the Dane County Sheriff's Office. "Then we'll also have to look to the coroner's office for their investigation of cause of death." Authorities shut down the roadway for three hours to clean up the crash. All three were wearing seat belts at the time of the crash, WISC-TV reported. Patricia Blanche Egelhof, 77, of New Dorp, a homemaker, died Monday in Staten Island University Hospital, Ocean Breeze. Born Patricia Blanche Fay in Oak Park, Ill., she moved to Huguenot in 1960 and to New Dorp in 1966. After graduating from an art program at the Chicago School of Commercial Art, she worked as a commercial artist and model for several years before marrying Joseph B. Egelhof, an award-winning journalist with the Chicago Tribune press service, in 1946. She continued her artwork on a nonprofessional basis throughout her life. While raising her children in New Dorp, Mrs. Egelhof made pastel portraits of the neighborhood children, many of which are still prominently displayed in the homes of their parents, her family said. "She was a wonderful mother," said her daughter, Teresa Egelhof. "She made every one of us feel special." An avid reader of historical and archeological books, Mrs. Egelhof also enjoyed collecting antique dolls. She was a past member of the Staten Island Archeological Society and a volunteer with Freedom From Fear. Mrs. Egelhof was a parishioner of Our Lady Queen of Peace R. C. Church, New Dorp. Her husband of 34 years, Joseph, died in 1980. In addition to her daughter, Teresa, surviving are three sons, Michael, John and Francis; four more daughters, Kristin Choo, Anne Ritchie, Mary Pendergast and Jennifer Mullikin; a brother, Thomas Fay; two sisters, Rita Atkinson and Betty Joan Reuter, and 11 grandchildren. 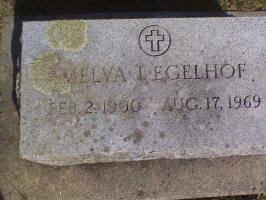 Mrs. Egelhof's son, William, died in 1958. The funeral will be Friday from the Hanley Funeral Home, New Dorp, with a mass at 9:30 a.m. in Our Lady Queen of Peace Church. Burial will be in Moravian Cemetery, New Dorp. Lena A. Schroer, 93, a former Newington resident, died Wednesday (April 30, 2008). Born in O'Neil, NE, daughter of the late Charles and Hattie (Good) Schroer, she grew up in South Dakota, moving to Newington in 1947. She attended St. Mary's Church. Lena was employed by Spencer Turbine of West Hartford for many years and later retired from the State of Connecticut, Dept. of Motor Vehicles. She was a member of the Friends of the Lucy Robbins Welles Library and the AARP. Lena is survived by her brothers August C. Schroer, of San Antonio, TX, Clair A. Schroer, of Park Forest, IL, her sister Arlene Jordan and her husband Harold, of Wethersfield, many nieces, nephews, grandnieces and grandnephews. 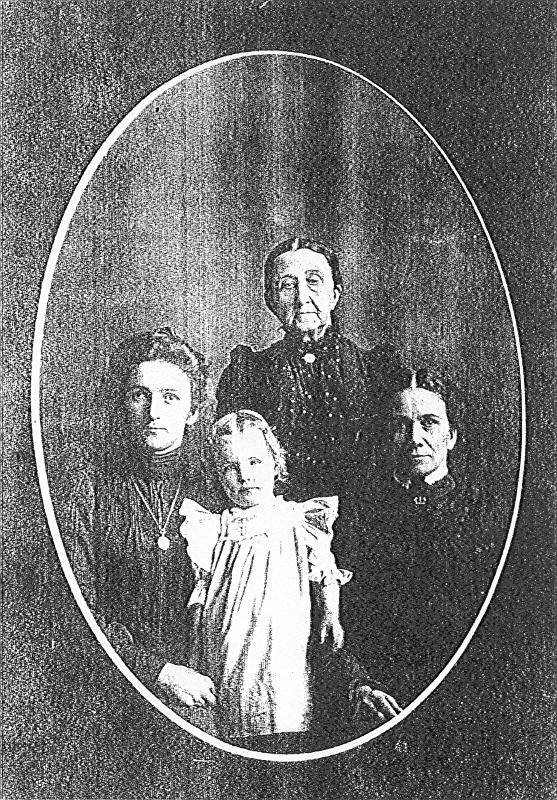 Lena was predeceased by two brothers Henry Schroer, and Carl Schroer, three sisters Hattie M. Schroer, Vera Goodale and Ardelle Egelhof. Her funeral service will be held on Monday at 11 a.m. at the Newington Memorial Funeral Home, 20 Bonair Ave., Newington. Burial will follow in West Meadow Cemetery. Family and friends are invited to call Monday from 10-11 a. m, at Newington Memorial. Memorial donations may be made to My Sister's Place, 102 Pliny St., Hartford, CT 06120. SCHROER, Hattie M. Hattie M. Schroer, 88, of Newington, died Sunday, (March 25, 2007). Born in Lincoln, NE, daughter of the late Charles and Hattie (Good) Schroer, she lived in the greater Hartford area since 1956. Hattie was a member of St. Mary's Church, Newington. Before her retirement, Hattie was a nurse at the Newington Veterans Hospital for many years. She is survived by her three sisters, Lena A. Schroer of Newington, Ardelle Egelhof of Chicago, IL, Arlene Jordan of Wethersfield; two brothers, August C. Schroer of San Antonio, TX, Clair A. Schroer of Park Forest, IL; many nieces and nephews. She was pre-deceased by her brothers, Carl and Henry Schroer and her sister, Vera Goodale. Her funeral services will be private with interment in West Meadow Cemetery, Newington. Memorial donations may be made to the Monsignor Bojnowski Manor, 50 Pulaski St., New Britain, CT 06053. Newington Memorial Funeral Home, 20 Bonair Ave., Newington, CT is serving the family. To share a memory with the family, please visit us at www.newingtonmemorial.com. ALEE, VIRGINIA LORAINE; of Troy; October 27, 2003; age 90; born April 17, 1913 in Detroit, Michigan; the daughter of the late Ralph and Jennie Alee; cousin of Harry William Alee (Marlene) and Ralph Waldo Alee (Elizabeth); preceded in death by her brother. A private Funeral Service was held. Interment Ottawa Park Cemetery. Arrangements by Donelson, Johns and Evans Funeral Home. John Franklin Sladek was born May 1, 1941, in Illinois.